Alright chicks, let me just refresh you on the fact that I’m a DIY dummy. Like, for reals, I tried to DIY honeymoon shirts for my cousin’s bridal shower this past weekend (not Etsy-ing this s*** was my first mistake), and when I got to the venue on Sunday, I realized that half of the iron-on letters had peeled off… So, yah, I had to tell her that her basic honeymooning ‘airplane’ apparel was MIA for the moment - to be fixed and furnished at a later time. That’s where I stand with DIY. I don’t die FOR it, I actually die FROM it. But that’s only because my craftiness doesn’t quite stack up to my creativity. I can conceptualize, but execution is where things go south. In any case, since Making It ended, I’ve found myself wanting to get into the maker club and I’ve been looking for something to tackle tacktile-y. And I finally found it in DIY-ed wedding invitations. Granted, I’m already married, so that 🚢 has sailed, but for any of my soon-to-be-wed peeps, this one’s for you! Jamie Wolfer, an OC [California] wedding planner, OG at DIY, and our bestie, basically, just dropped a new video on her YouTube channel, and it is 🙌🙌🙌. 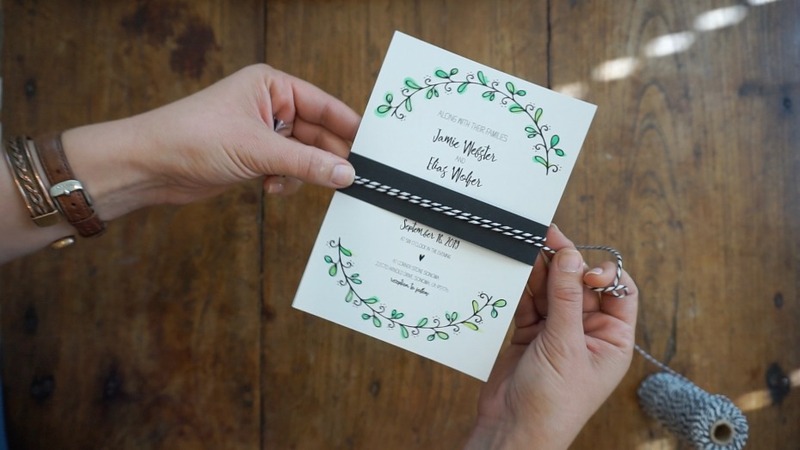 The main takeaway - if you don’t have 10 minutes to spare - is that if you don’t have the budget for custom made wedding invites or would rather just doctor them up yourselves, you can. You just need some vision, a trip to Michael’s, and a solid template (via an online printable) to start with. Luckily, we have lots of those, and they’re 100p FREE FREE FREE 😍. Sooo, since you’re not going for broke with bespoke stationery, you can allocate some of the savings towards your styling supplies. Choose something simple and add some paint. 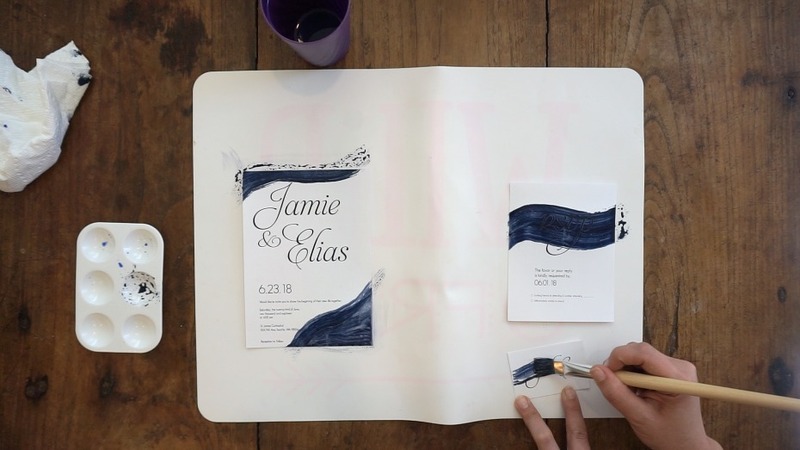 For the couple who likes something classic, like a white invite with simple black typography, but wants to inject some soft color - do it with watercolor paint! Jamie used a dark navy, which worked well, but we’re totally into ombre-effect pastels. And if you pick something like this, you can color the leaves for a nice burst of color on an otherwise simple, understated suite. Lock in on a look and add layers of texture for theme-building. For the couple who likes something rustic, print this design on kraft paper, and then start layering on mixed media materials. 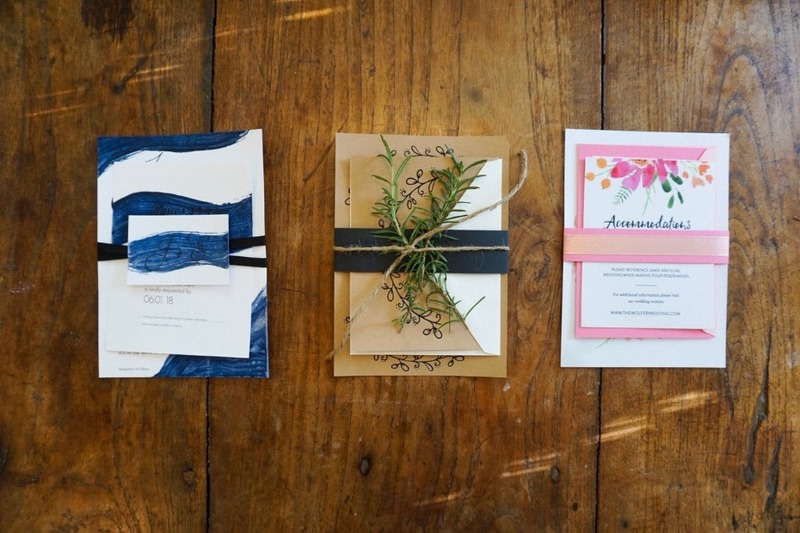 Jamie did it with kraft and then mixed in some ivory return envelopes for some chic contrast. 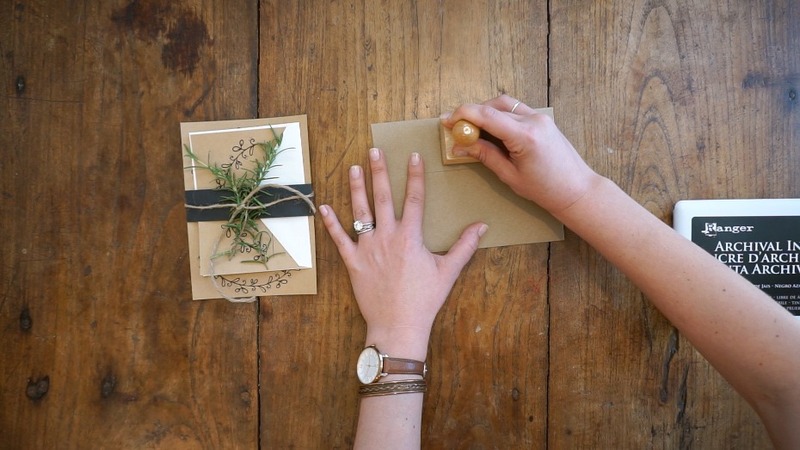 Bringing in some twine, sprigs of rosemary, and a custom initials stamp just takes the rusticity next-level, and it’s a seriously pretty picture. I’d post about it if I got one in the mail #inviteenvy. Pick a vibrant print and pull inspo from the palette. 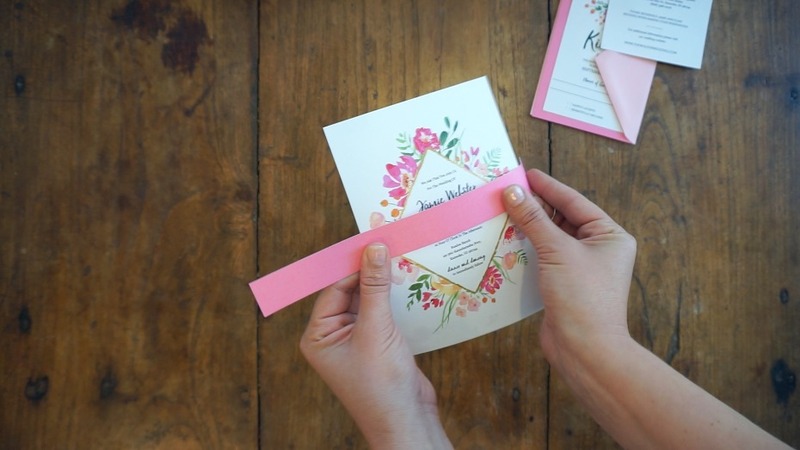 For the couple who might be having a spring or summer wedding, or just isn’t scared to do something bold with color, start with a modern floral invite, and then distill the design into color cues. That’s where you can play around with different shades of cardstock that all work together and harken back to the multi-hued print.